You probably already know the good old 12-bar blues progression. Formed of three chords, it’s perhaps the most commonly-used sequence in blues, rock and loads of other styles too. 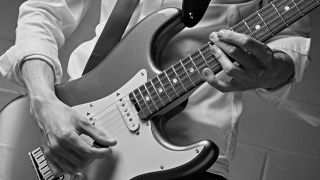 Most guitarists can jam through the progression, but have a listen to players such as Jimi Hendrix, Stevie Ray Vaughan or John Mayer and you’ll hear just how far you can go beyond those basic chords. With that in mind, this month we’re taking a look at some of the phrasing tricks of the blues greats. Our tabbed ideas outline the 12-bar blues changes, but, with a little creativity, you can easily expand them into full-on solo licks, too. Here in this Texas Flood-style lick the E7 line in bar 3 is a straight copy of bar 1 – just seven frets higher than the A7. You could use the same shapes in 10th position for the D7 in bar 2 but we’ve opted for a different approach; by extending a D chord (D F# A) to include C and E notes you get a bluesy D9 sound (D F# A C E). You can also extend the sound of a dominant 7th chord with these typical Stormy Monday-style sliding chords. The upper note on the first chord in each bar is a major 6th interval, while the middle note in the second chord helps give us a dominant 9th sound. These four examples can be adapted for each of the three chords by transposing them up or down the fretboard. The final E7 line can be played two frets lower to target the D7 chord, for example. Similarly, the D7 lick can be played two frets higher to target the E7 chord. Targeting chords in a solo can is a great way to liven things up – and this example transposes four different shapes up and down the neck to outline each chord. These don’t have to be played in order, but you do need to land on one of the four shapes of each group when changing chord. Once you’ve tried the tab exercises and also had a go at creatively adapting them in different areas of the fretboard, you’ll develop a better idea of each concept/shape and when to use them for whatever you happen to be playing. Experiment by trying one or two of these different chord tone approaches in your next jam. It could be as simple as adding a few of the licks in a standard blues, or really trying to nail each of the chord changes.